Stephanie has a masters degree in History from the University of Strathclyde, specializing in castle conservation, as well as a second masters in Architectural Conservation from University of Edinburgh. She designed the Burgie greenhouse work plan in 2017 and continues as project manager in 2019. AiP is actively seeking sponsors. Join us in saving this rare Edwardian greenhouse and continuing invaluable plant conservation efforts. Hamish Lochore took on the cause of fostering trees about twelve years ago after retiring. He spends countless hours raising trees from seed and planting them in an 80-acre arboretum. The arboretum is open to all who wish to come and see the great variety of trees. His vision is to identify trees that will thrive in the region as climate change occurs. Most of the seeds are hand collected by volunteers around the world, who send them to Hamish for planting. If you are fundraising for your trip and would like a breakdown of costs, contact AiP. Join us for one adventure in preservation, and you’ll receive a 10% discount on all subsequent adventures. Travel health insurance, including emergency evacuation coverage. Send AiP proof of purchase. Learn the intricacies of glasshouse conservation from timber repair to stabilization to reglazing. AiP is excited to continue our project at the Burgie greenhouse, where the central glasshouse is now repaired and reglazed. Picture yourself arriving in northern Scotland and delighting in the area’s unique microclimate – both warmer and drier than the rest of Scotland. Explore the Burgie Estate: the ruins of a medieval castle, an elegant country home, and a man named Hamish who is dedicating his property to conservation. With a feeling of urgency to repair the east room before the structural timber fails, we invite you to join us in leaving a lasting legacy. We hope the call of Scotland will bring you in October! The Burgie greenhouse, or glasshouse as it was originally called, was built in 1912. With both a window tax and a glass tax imposed during the Edwardian era, even the smallest conservatory was seen as remarkable. For the past twelve years, Hamish Lochore has researched and collected tree seeds from around the world best suited for the region. His goal is to help address the effects of climate change, which has stressed the native species of trees. A network of friends and volunteers works worldwide collecting and hand selecting seeds and sending them to Scotland. The seeds are nurtured in the greenhouse, and then planted in the arboretum. Without a working greenhouse, development of the arboretum is impossible. The east room of this valuable Edwardian greenhouse is deteriorating, with a cracked structural timber. It is in dire need of conservation. The focus of the 2019 conservation experience is timber repair and stabilization. This room is beautifully styled and greatly compliments the central glasshouse, both in beauty and utility. Work begins daily at 9am, after a leisurely breakfast, with a discussion of the day’s tasks and demonstration of skills as needed. There is an hour lunch break; work ends about 5pm. The glassed-in greenhouse has been a Godsend with all this year’s seed trayed and ready to germinate in the spring!!! Opportunities for excursions in this region of Scotland abound. You might consider extending your visit to Scotland, before or after your project session, to take advantage of Scotland’s many historic and natural sites. We will spend a day each session, and several evenings, exploring the region’s amazing cultural heritage and scenery. From castles to distilleries, with striking landscapes at every turn, this coastal area will enchant you! Meals and entrance fees during the excursion are not included in your fee and are the responsibility of each person. Accommodations will be provided at the Burgie house, which is built over 4 floors with plenty of breakaway space for everyone. 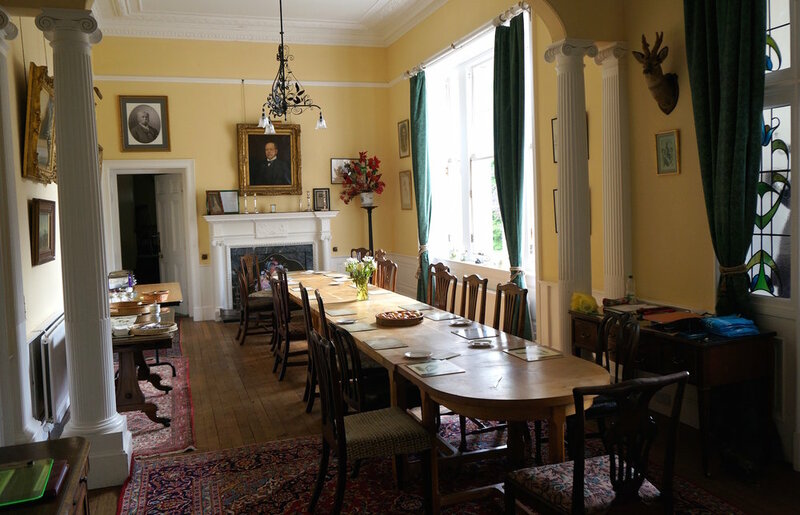 The house provides warmth and charm, being traditionally furnished with many family antiques. Spacious bedrooms all have lovely views. Your fee covers 6 nights in a double room. Session 1 begins Monday, September 30, and goes through Saturday, October 5, with departure October 6. Session 2 is Sunday, October 6 through Friday, October 11, with departure October 12. Single rooms are available for a supplemental fee. Most meals will be eaten at the Burgie house, prepared by a superb local cook. Dishes will introduce you to local cuisine and produce, with options for vegetarians provided upon request. Meals during excursions are not included in your fee and are the responsibility of each person. Free wifi access and laundry facilities are available in the house. Kitchen facilities are available for your use. My favorite part – All of it! Meeting new friends, spending time in the glorious Highlands, being able to work in such an interesting historic place. The entire project was extremely rewarding. Your project fee of USD1540 per session covers the cost of lodging in a double room, most meals, excursions, training and materials, and transportation to and from Inverness Airport. If you prefer a single room, an additional single supplement will be added to your fee. Residents living in the Moray region are welcome to join us. Come for several days or for the entire session and help save an important piece of your local history. Your fee will be adjusted depending on need for lodging, meals and so on. Contact AiP if you are interested. If flying, the Inverness Airport is closest to the project site, and airport pickup can be arranged from Inverness. If you plan to rent a car, the drive from the Inverness Airport is about 25 minutes (26 miles); from Aberdeen International Airport is a little over 2 hours (75 miles); and from Edinburgh is about 3.5 hours (170 miles). High temperatures in early October average about 55F, with lows around 41F. Bring clothing that is appropriate for the temperatures and also protective while working. Rain is always possible, so bring adequate rain gear with sweaters and sweatshirts to layer underneath. Close-toed shoes are a requirement for the work site. If you would like assistance with travel arrangements, contact Peace Frogs Travel/Outfitters, AiP’s partnering travel agency. Autumn in northern Scotland is hard to beat – Register today! If you have any questions or would like to chat with an AiP staff member about joining this cultural heritage experience, contact us at trips@adventuresinpreservation.org or call us at +1 303-444-0128.